A common utility uniting all of our proposed basic research and clinical applications is a modular multi-scale modeling platform for: (1.) representing molecular-to-whole organ function in experimental models, individual patients, and human populations; (2.) interpolating between in vivo and in vitro function in a variety of contexts; (3.) interpreting and predicting commonalities and differences in disease mechanisms and therapeutic responses between animal models and clinical cohorts; and (4.) guiding personalized diagnosis and making effective use of individual patient data in designing precision treatments. The scope of physiological systems represented by our multi-scale modeling efforts is illustrated above. At the core is the cardiovascular system with lumped-element modules representing parallel vascular beds. Modules representing individual components have been developed and identified by targeted experiments under the individual projects. 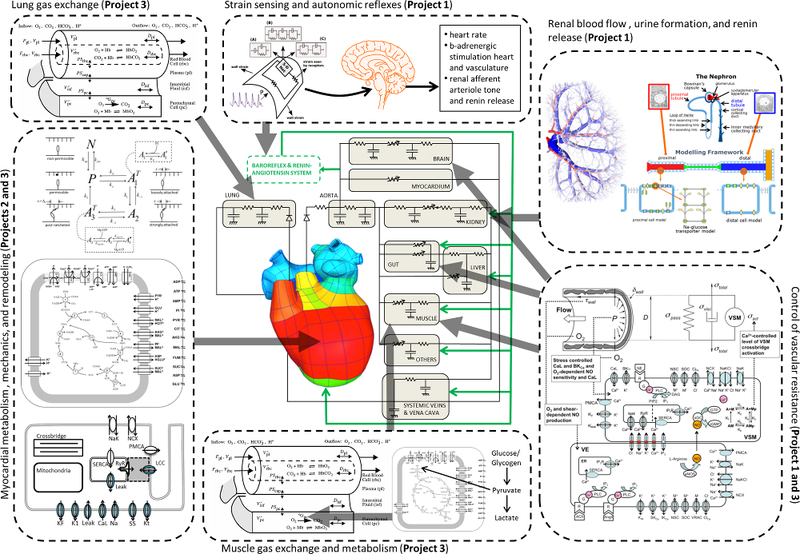 Each project proposes new experiments to characterize new pathways, tests hypotheses, and to quantify function in multiple experimental models selected to be broadly informative of cardiovascular function and dysfunction. Follow the link to learn about some of the important scientific discoveries and contributions made by the Virtual Physiological Rat project.